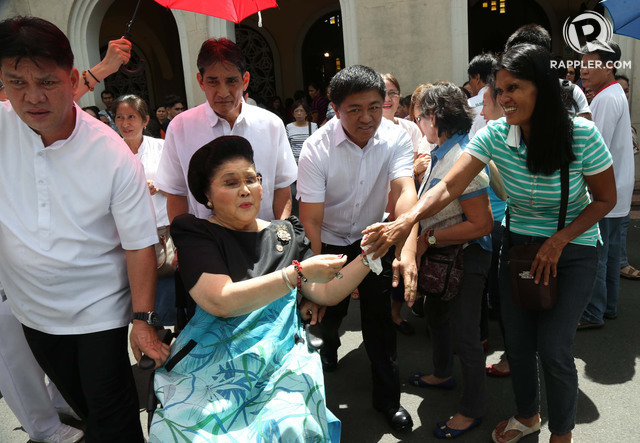 MANILA, Philippines – Imelda Marcos sat through a memorial Mass for victims of her late husband’s regime, after the former Philippine first lady arrived at the wrong church service, witnesses said Thursday, February 25. The wheelchair-bound widow, 86, listened Wednesday as a torture victim shared harrowing memories and a Catholic priest delivered a homily on the lessons of Ferdinand Marcos’ martial-law rule. 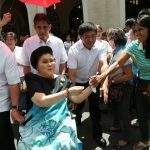 Ric Malasa, an aide to Marcos, who remains a member of the House of Representatives, told AFP a member of her staff had whispered to her they had turned up at the wrong service at Manila’s popular Redemptorist Church. Human rights groups say tens of thousands of people were jailed and tortured during Ferdinand Marcos’ 20-year military-backed rule, which ended in a bloodless popular revolt that chased the family into US exile 30 years ago Thursday. The current authorities now estimate the family plundered $10 billion from state coffers, which allowed the flamboyant first lady to live a jetsetting lifestyle in which she amassed hundreds of pairs of shoes as well as jewelry and pieces of art. But mass-goers, many of them campaigners for the rights of people who suffered imprisonment and torture during the Marcos regime, showed no sign of disrespect to the widow at the service, according to Carlito Latorre, a lay missionary. “One of the victims, a man, shared how he lost his sense of hearing from the torture,” Latorre told AFP. “The priest said martial law must not be repeated and its lessons must not be forgotten,” Latorre said, adding Marcos left abruptly after the homily. “We’re hoping she listened to the sermon and that she would not disregard it,” he added. Ferdinand Marcos died in Hawaii in 1989, but his heirs returned to the Philippines in the early 1990s to set in train a stunning political comeback.